Last BCS was 34th Batch. 34 BCS written exam was held on 24th March, 2015. More than 9 thousand applicants have passed this exam. 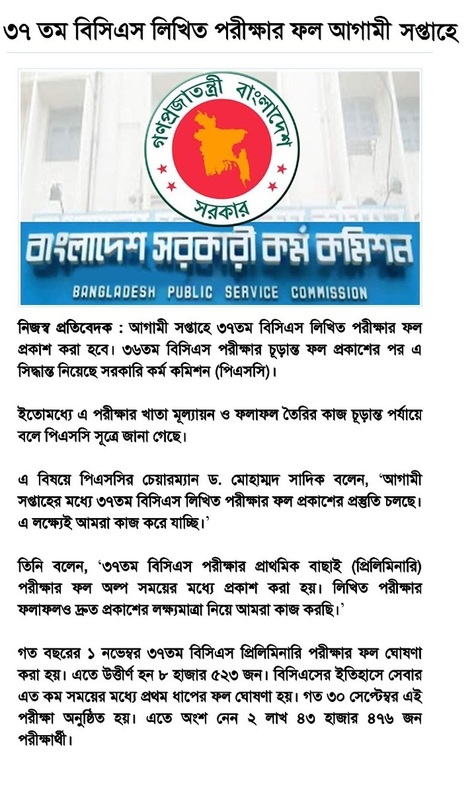 Bangladesh Public Service Commission (BPSC) handle major recruitment in Bangladesh. Every year they take BCS exam as regular recruitment in various department of public service. Police, Magistrate, Administration, Ansar, Foreign Affairs, NBR, Tax Officers, Teachers, Doctors come from BCS. Written exam will be held all divisional city at a time. Written test venues are Dhaka, Rajshahi, Khulna, Chittagong, Sylhet, Comilla, Barisal etc. Examinees registration number is six digit. If it is less than 6 digit then zero will add at beginning of the number. Admit card would not provided newly because MCQ exam admit card will reuse here. In Exam center, candidates could not carry any bag, calculator, mobile or others electronics devices. They have attend exam center before 15 min and they should carry national id card.